Parsley is a bright green, biennial herb that is very common in Middle Eastern, European, and American cooking. Its value as a breath-freshener, and much of its taste, come from its high concentration of chlorophyll. It is also high in vitamin C.
Two forms of parsley are used as herbs: curly leaf and Italian or flat leaf. Curly leaf parsley is often used as a garnish. Many people think flat leaf parsley has a stronger flavor, and it is sometimes used as a substitute for coriander leaves. 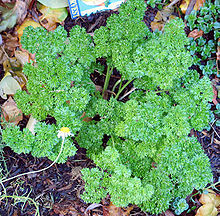 Its flat leaves are less springy than those of curly leaf parsley, and hence it is easier to chop. Another type of parsley, Hamburg parsley, is grown for its edible root, similar in appearance to a parsnip.